Original Thread: Take The Beginning Of Your Last Breath In Let's Play Breath Of Death VII! Well, it's time to start a project that I've wanted to do ever since I got serious about actually LP'ing things and not just thinking about it. I wanted to start my LP career with Cthulhu Saves The World, and now I feel like I've done enough that I can tackle this, but it's not fair to just start with CSTW. 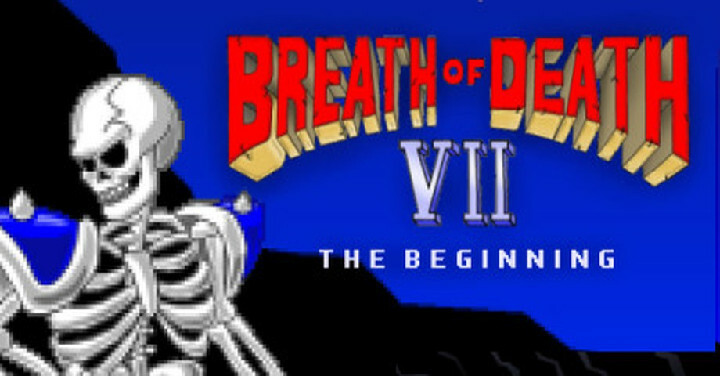 Breath of Death VII is the predecessor to it, the first RPG made by Zeboyd Games, who have also done a couple of interactive novels and as well as the third and fourth episodes of the Penny Arcade games, the Rain Slick Precipice of Darkness ones. BoDVII is a comedy RPG, and it pretty well succeeds at what it does. It's amusing, easy to get into, and your four playable characters are all different, unique in their own ways, add their own twists and turns to the plot, and feel different from each other. It's like how the cast of Final Fantasy IV or the cast of Earthbound has their own roles; there are also branching ability trees for the characters in this game. Upon leveling up, you can choose from two options for what you'd like to have raised; they're usually an option between a physical or magical attack, or raising physical or magical-based stats. However, you can take your physical heavy main character and turn him into a pseudo-caster, while taking your caster and making her more of a killing machine. As you might have reckoned by now, we're going to do a twofer here; this thread is going to be for Breath of Death VII: The Beginning, while my next thread is going to cover Cthulhu Saves The World. They use very similar systems, but CSTW has some definite improvements that make it a better game. BoD is not a bad game, by any measure, and if you're a fan of old RPGs, such as Dragon Quest, you should check into giving it a shot. It's super-cheap on Steam (as in, you can get both games for $2.99), and they've got a good bit of content for that price. We'll be spending around fifteen hours or so (I'm highballing that estimate) on each game. I'm going to aim for at least three updates a week, but some of you are already saying that I'll have four, maybe five. It's not crazy to think that; I seem to remember a time when you could count on seven to nine updates a week from me, but being married, having a baby on the way, and a job, I can't guarantee I'll update like I just discovered meth. With that said, we're going to start this adventure. Let's dance. Update Ten: Have You Ever Danced With The Ultimate Evil In The Pale Moonlight?